Set pan over medium high heat. Add a layer of Mozzarella cheese to the bottom of the pan. When the cheese starts bubbling, add toppings (don’t overload it or you’ll have a tough time later). Start watching the edges of the cheese. Once the edges start to brown, use a spatula to loosen them; when browned all the way around, you can carefully slide the spatula under the “pizza” and slide it off onto a plate. Let the pizza cool just a bit so the cheese will firm up. 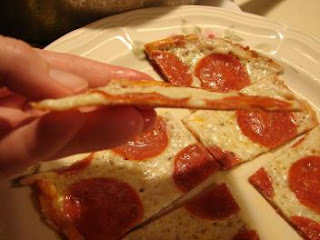 Then you can use a pizza cutter to slice it up. Now you can pick it up with your hands and eat it just like a regular pizza. I make this all the time! LOVE LOVE LOVE IT! I do add a sprinkle of Italian seasoning and garlic powder on the cheese as soon as it's put in the pan. This gives it a bit more flavor - especially when making a veggie pizza and it doesn't have the pepperoni for flavor. This goes in my "recipes to try" file. Okay just made it with pepperoni and a little bit of red pepper. Pretty good! Thanks for the idea! Side note: it's really filling. I can only eat 2/3 of it and I was hungry. I just happen to have pepperoni and mozzarella in the frig. This will be Friday night supper! LOVE that Paula!!! 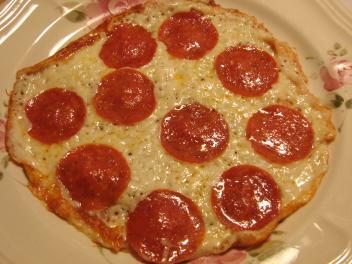 I've made "mounds" of mozz and pepperoni in the oven but a whole "pizza" - love it! I make this all the time. However I add a table spoon of pizza sauce. I have a pizza sauce I found that is 1g carb and less than 1g of sugar. However you have to put it on when you are done or it will be soggy and wet. I like the 'quick and easy' factor! Glad you liked it. I finally made this last night. It was really good! It was nice and crisp, so I could dip it in Rao's. It was kind of like pizza nachos.